When you look at them both from a features standpoint, the Home Cinema 2040 and Home Cinema 2045 projectors from Epson are basically identical. The only real difference is the fact that the 2045 has Miracast, which allows you to talk to the projector wirelessly from devices compatible with Miracast, including tablets, computers, and smartphones. With that being said, whatever you want to accomplish on one projector can be completed on the other thanks to the built-in MHL on one of the HDMI ports. This allows you to use a streaming stick or connect directly to a tablet or other device. The only benefit to Miracast on the 2045 is that this connection is wireless, which does have its own advantages. The 2040 has a lot to brag about, especially where its image processing is concerned. The 2040, to nobody’s surprise, does 3D and, even on a 100″ screen, the 3D remains bright. A lot of projectors that are focused on being a “theater room” projector usually lack in overall brightness but try to make the same claim. Epson has a pretty nice detail enhancement feature that is pretty good though it isn’t as fancy as the full Super-Resolution package. Super-Resolution does show up on some of Epson’s projectors though they are about 3x the price of the 2040. One good thing about both of these projectors is that they both have Creative Frame Interpolation (CFI), otherwise known as smooth motion, which is terribly hard to find on a projector that costs less than $1,000. CFI is usually used on sports more than general TV, and a lot of projector fans don’t like CFI on their 24fps movies. So you can imagine that a projector like the 2040 will most likely be used for watching sports or general HDTV as opposed to in a dark room for watching movies. Regardless, you’d rather have CFI on something like the 2040 instead of a projector that costs you $3,000. The 2040 also comes with rather good color right out of the box. In most cases, you’re using Cinema or Bright Cinema modes or their 3D projector equivalents. This projector is also good at revealing dark shadow details though the black levels are not as good as the color. When it comes to the warranty, you’re getting a pretty good deal, especially for the price. The warranty for the 2040 is 2 years with 2 years of rapid replacement service. A lot of projectors at this price range only have 1-year parts and labor warranties, though ViewSonic beats out everyone with a 3-year warranty. In terms of hardware, there is a manual zoom lens with an expected amount of zooming capabilities and keystone correction. In addition to that, this projector only weighs 5.7 pounds, so you can easily transport it wherever you want, and there is also a built-in speaker and audio out. These projectors are good, all-around projectors for the family. If you want a nice little projector that comes with no hassles, an easy setup, and a warranty that is better than most others than the Home Cinema 2040 or Home Cinema 2045 may be the projectors you’re looking for. The feature sets are great and these projectors are perfect for simple plug-and-play operations, and the CFI is an added bonus. Oh, and did I mention that they both won Best in Class – Value awards? You can get the Home Cinema 2040 from Epson for $799 and the Home Cinema 2045 for $849. The office projector. It can make meetings and projects really amazing, but it can also hold things up, especially if you have a complicated projector or someone who simply doesn’t know what they are doing. With business professionals becoming increasingly busier, there is less time than ever when it comes to our daily schedules. Despite this fact, a lot of companies continue to use cheap projectors. They don’t do any research on the products and invest in something that causes more stress than productivity in the long run. 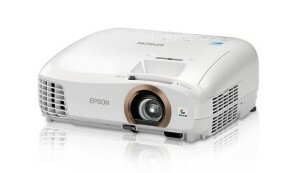 Thankfully, 2015 has offered us up some really great office projectors. Now is as good a time as any to upgrade that old projector in the conference room into something that fits with your modern staff in these modern technological times. 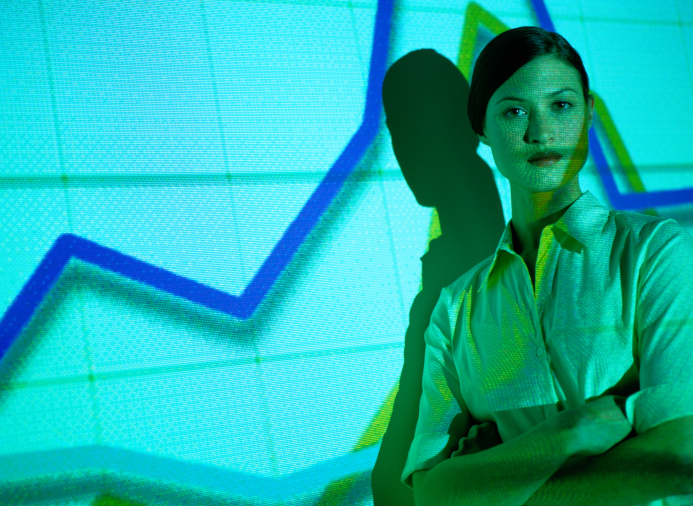 Here are the Top 5 Business Projectors of 2015. This projector is perfect if your meetings are never in the same location twice. This projector weighs in at 5.29 pounds and measures 11.7″ x 9.0″ x 3.0″. In addition to that, this projector also supports USB, WiFi, VGA, HDMI, and mobile MHL connectivity. This projector offers easy mobility along with easy use. Booting and choosing your input source takes about 30 seconds. A 3,000-lumen lamp is just the icing on the cake. This one may not be the smallest projector out there, but it does have a lot more power than some of the other Pico projectors on the list. The ML550 is extremely portable, weighing in at 0.83 pounds and measuring 4.1″ x 4.2″ x 1.5″. The 550-lumen lamp is the real kicker here, allowing you to project in complete darkness. Looking for a Quote on a Projector Rental for Your Business Event? 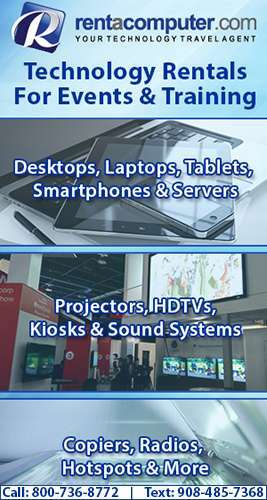 Rentacomputer.com has a full range of Projector Rentals that can be delivered to your business event anywhere in the United States! The EB-X11 is a good, middle-of-the-pack, projector. It measures 11.6″ x 11.9″ x 3.0″ and weighs 5.1 pounds. One particular feature that a lot of users will enjoy is the lens cover that instantly shuts off the lamp and speakers. The lamp itself has a rating of 2600 lumens though the projector is not without its flaws. The projector only has a 4:3 aspect ratio and photos don’t have the sharpest resolution. In addition to that, the USB port can only handle photos and the projector doesn’t have a WiFi option. This projector is shockingly small, even compared to other Pico projectors. This one measures in at 2.8″ x 2.8″ x 1.1″ and only weighs a quarter of a pound. This could be a great way to surprise unsuspecting employees with a meeting they were unaware of. Setup with this projector is very easy and you can display almost any content on it. Power is drawn via USB, though there have been reports of this projector not working well with the MacBook Air, plus you’ll need a completely black room in order for the 55-lumen lamp to produce an image you are able to see. 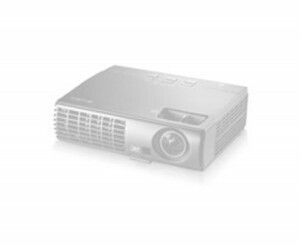 If you typically have meetings in bright rooms, or price isn’t a huge factor, then this is the projector for you. The Pro8600 weighs 8.5 pounds and measures 13.1″ x 10.4″ x 4.3″ ith the Pro8520HD weighing 8.5 pounds and measuring 13.1″ x 10.4″ x 4.8″. Both of these projectors run very loud and bright with the Pro8600 having a 6000-lumen output and the Pro8520HD having a 5000-lumen output. Neither projector is particularly good with USB though both have HDMI slots with the Pro8520HD having 2. If you or your company is in the market for a new projector for your conference room, then one of these 5 projectors are sure to satisfy your needs. Granted, these may not be the best projectors of all time, but they are the best ones that have come out this year. Google Glass is truly technology of the future, taking wearable technology to the next level. Since the technology is still too expensive for mainstream use it appeared as if Google had seemingly forgotten about Google Glass in favor of other wearable technology, like Android Wear and other Android and Chrome products. However, a new patent filed by Google could be suggesting that the company is working on an updated version of the heads-up display (HUD). This new patent from Google appears to have a version of Google Glass that comes with a built-in projector on board. Because obviously it wasn’t too expensive before. 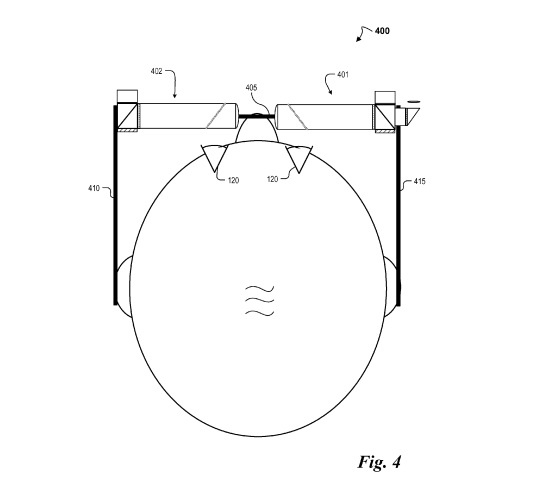 This newly discovered patent, which was filed back in April 2013 and published on October 30th, describes a “head-mounted display including integrated projector.” Images that accompany the patent also suggest that it could be an updated or modified version of Google Glass with a small projector attached to the side. In addition to that, the patent also goes on to explain the main purpose of this new hardware could be for sharing information with people around you. 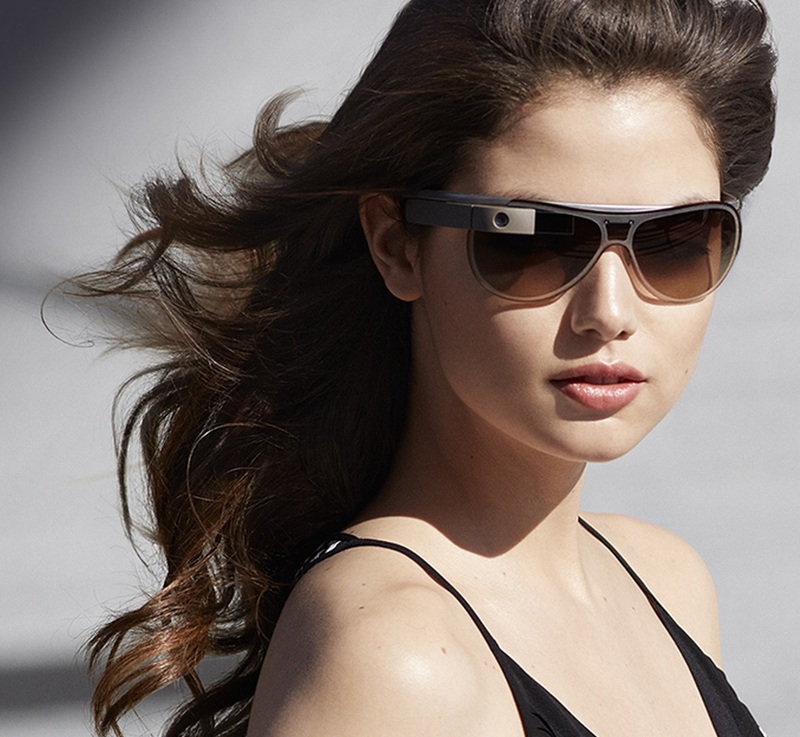 Google Glass brings a ton of advantages to mobile tech users but it’s all very personal. There really isn’t any way to share stuff from Google Glass with people around you. Adding a projector could turn Google Glass into a group technology. The addition of a projector could allow you to project photos or video taken with Google Glass to easily share this content with friends and family. The bad thing about this, and every other patent that gets released, is that there is no guarantee that technology will ever become a reality. Add that to the fact that it seems as if Google has all but abandoned Google Glass altogether and is content with turning out smaller updates for the current Google Glass. Putting a projector on Google Glass could help add more functionality. I still don’t see a real need for something like Google Glass, even with an attached projector. The technology is cool, don’t get me wrong, but there just doesn’t seem to be a real need for it. I mean there was already a report of someone being treated for Google Glass addiction. Regardless, Google Glass is still a thing and even though it may be on the back burner at the moment there is still the very real possibility that we could be seeing a Google Glass version with a built-in projector. Today’s business world isn’t the same as it was 20 years ago, or even 5 years ago for that matter. The business professional of today utilizes technology in ways would couldn’t have even thought possible in the past, especially when it comes to presentations. 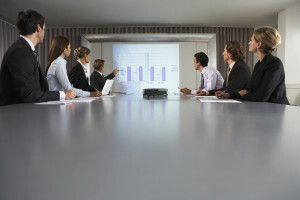 Gone are the days of story boards and physical presentations, pushed aside for things like PowerPoints and slide shows. However, a lot of presentations these days rely on internet access for various things, which becomes a problem if you are presenting somewhere that doesn’t have internet (I know it’s hard to believe a place without internet but trust me, they still exist). 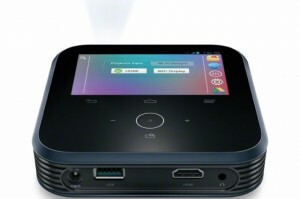 But those troubles are now behind you as you now have the ability to purchase a combination pocket projector and mobile hotspot from Sprint that provides internet access through the carrier’s network. Known as the Sprint LivePro, this pocket projector measures 4.7 by 4.7 inches and is 1.1 inches thick. In addition to that, the LivePro will offer a 10-inch to 10-foot projection display. There is also a 4-inch touchscreen on the device and a 5,000mAh lithium ion battery that can be used to charge other devices while the device itself runs on Android 4.2 Jelly Bean, allowing you to access apps from Google Play. An embedded speaker for audio is included though separate speakers can be paired with the device through Bluetooth or attached via a 3.5mm jack, according to Sprint. The LivePro also supports as many as 8 WiFi enabled devices simultaneously and content can be shared through HDMI, USB or wirelessly through WiFi Miracast. Users can also get content from the Cloud through WiFi directly from the device and stream video and audio content with a WiFi connection or data plan. The LivePro will be on sale in select Sprint stores as well as online for $499.99. Qualified buyers can also use Sprint Easy Pay for $18.75 per month over 2 years. Data plans for the LivePro start at $34.99 per month for 3GB with 6GB and 12GB data plans costing $49.99 and $79.99, respectively. For those of you who don’t know, Spark is a network upgrade that is intended to more than double the wireless broadband speed on the 4G LTE Sprint Spark network in the US by the end of 2014. In addition to that, it is also supposed to increase coverage and capacity significantly. Spark has been described as a mixture of TD-LTE and FD-LTE networks on three different frequencies (800MHz, 1900MHz and 2600MHz) and increase to extremely high capacity in very dense areas with TD-LTE 2600MHz. The LivePro is perfect for business professionals as it allows them to literally present anywhere they need to whenever they need to. Mobile presentations are definitely impressive and that becomes even more so when you add the LivePro’s mobile hotspot, ability to connect 8 devices simultaneously and download apps from Google Play directly onto the projector. I’m usually the type of techie that is always up for trying new ideas and gadgets out. I love seeing innovation and progress in our technology. It’s always incredible to see just how far our advances have taken us. While, yes, we’ve seen quite a bit of advancement in the realm of mobile technology, projectors have seen their fair share of upgrades as well. Most of the updates that projectors have seen have definitely warranted some type of use and practicality within them. Others, not so much. Now 4K projectors, short-throw projectors, and even the pico projectors that could end up in our phones in the very near future, all have a good sense of usefulness. One product whose usefulness may still be questionable is interactive projectors. We’ve all seen them. Perhaps you’ve been walking around the mall and have seen kids jumping around on a lit up floor with a projector above them. They may be jumping and playing with an interactive game. You’ve seen them in museums when you’ve walked in front of a wall and magically seen a rippling effect as you move around. You’ve even seen them more recently. The Xbox Kinect has even played its part in new interactive projector technology. Because of the Xbox Kinect having direct involvement with interactive projector technology, it can only mean one thing; Microsoft is working on something new. Microsoft is working on something called Project Ripple, in which there will be an interactive projector system, but with two different “screens” instead of the one. While most of us may be used to the typical “floor screen” being projected down below us, the second screen will be directly in front of us. How will you be able to control the second screen though? Simple! With the Kinect of course. You will essentially be able to step on the bottom screen and work the second screen with your hands. Not a bad way to make your next presentation a bit more riveting. That being said, there are still some things to discuss about this new project. Again, I enjoy trying new technology out, and if I see an interactive projector displaying lava and rocks on the floor, you’d better believe that I’ll be avoiding the lava and stepping on the rocks. The only issue I have with this type of technology is that I feel that that is just about the extent of it. I could be dead wrong or maybe just not opening up my mind to the options enough, but before that becomes finalized as fact, let me have a chance to explain what I mean. The average business office is just that, a BUSINESS office. I don’t feel that some type of interactive technology like this would be necessarily accepted within the office atmosphere. I find it to be a bit distracting. Microsoft is marketing their new Project Ripple to be used during presentations, delivering new information in a more interactive way, and interactive advertising. All of these ideas seem promising, but unless they are able to come forth and show just how well it can work and WILL work in a more formal setting, this type of technology just isn’t meant for your office conference room. Maybe at your company’s next convention for a fun presentation, but in my eyes, that’s about the extent of it. This Projector Suggests That We May Be Closer To Holograms, But Are We Really? I feel it’s safe to say that just about everyone of us has seen at least one Star Wars movie. Everyone has seen at least one scene or heard at least one quote from the series. One of the most popular being “Help me Obi Wan. You’re my only hope”. Our little R2-D2 showed a projected holographic image and back during that time, it was one of the coolest things to see even fake technology do something like that. We’re getting closer and closer to having holographic imaging become something that we freely view. While it may not be here completely, there is a new projector in the works that is showing how close we are getting. The projector itself doesn’t show off holograms, but it does offer the next best thing; a glasses free 3D experience. Everyone knows that holograms are extremely cool to look at and overall technically impressive. That being said, with the current technology and knowledge that we have right now, it’s also pretty darn pricey to create right now. Until that time comes that we can create these images at a more cost effective price, our friendly neighborhood researchers at MIT have been cooking up the 3D projector. Using 3D imaging without the use of the glasses, it quite the task it would seem. Our boys over at MIT may have come up with the proper way of doing it however. They’ve utilized two liquid crystal modulators which will create different images by angling the light in different areas. This altered angling of the light particles will be able to create different images depending on your respective point of view. Normally, most types of 3D imaging causes the image to lose a bit of its coloration. With the technology being implemented in the new projector, it will be able to keep the coloration and brightness from being affected too much. By using a computer graphics card, they will be able to sustain a lot of the images original data. This will mean that the brightness and color won’t be affected nearly as much as in other 3D images. So now, not only do you have a 3D projector that doesn’t require glasses, but it also maintains its image quality without being too affected. The researchers have also developed specific lenses specifically for this projector. The lens should widen the viewing angle, allowing for a better picture. Mind you that this particular projector isn’t completely perfect yet, nor are they really designing it to be. As they say, “you have to crawl before you can walk”. That is exactly the case here. We want the technology to create holograms at a cheap and cost effective price. That is still quite a ways away. We know that we saw it first hand when rapper Tupac came back from the dead to perform holographically at the Coachella Music Festival. The technology is here, we are still working out the kinks, but we are in the baby stages so that is to be expected. The fact that MIT is actually designing something like this for retail purposes, or even just to show that it can be done, just proves how much closer we’re getting to having our own Star Wars-esque holograms in our own homes and offices. It can be really hard to find the right projector for you to use. There are so many to choose from, each one coming with different options, functions, and sku names. It’s very easy to get lost in the sea of projectors and difficult to figure out which one may be right for you and your home or business. You’re obviously going to want something that is going to get the job done and get it done well. The only problem is trying not to break the bank at the same time. You have the initial cost of the projector and then any possible setup or mounting fees that go along with it. LG is known for making great entertainment tech, such as TVs and projectors. Well, LG is going to be offering a new LED model for retail, and for only $1,299. The new LG PF85U is looking to be a very good LED DLP Projector and a very smart one too, as it turns out. So should you choose to invest in this new projector when it comes out later this month, what exactly will you be getting? Well first off, you won’t have to worry about changing a lamp practically ever. You can thank the light emitting diode engine for that one. Since this projector is utilizing an LED engine, it has a much longer life span that most lamps. The projector will be able to turn on and be at full brightness, almost instantaneously. This type of lighting source also means that it can be turned on and off in rapid succession without needing to worry about affecting the lamp’s life span or degrading it. It will always use less energy and emit less heat when in use. I’d imagine that can only help, seeing as how the PF85U has 30,000 hours of use before needing to worry about changing the lamp. Next thing you’re most likely to be concerned with on the projector is the ports and its connectivity. What all can you hook up to it? With the PF85U, you’ll have access to two USB ports for external media devices and flash drives, two HDMI ports (one of which MHL capable), and 1/8″ and S/PDIF ports for external audio output. The projector itself does have speakers that come attached to it. However, 5-watt speakers on each side aren’t going to really give you the sound quality you may be looking for. The projector also comes complete with a coaxial jack input for antenna purposes. You’ll be able to plug one in and get access to either SD or HD television right from the projector itself. LG’s new projector is smart too. It may as well be a Smart TV. It comes with the ability to basically be a new media center for your home or business. The use of apps such as Netflix, Hulu, Amazon Instant Video, and Youtube mean that you’ll be able to watch whatever you may want or need directly from the device itself without having to gain access from an external media source. The device also utilizes other non-video related apps such as Facebook and Google Maps, furthering what it can be used for. The new PF85U also comes standard with a built-in web browser and an integrated App Store. With all the added functionality from the apps, you essentially have a new media center with LG’s new projector. While it may be more suited for home usage, it could still be used within the office or even the office’s break room for recreational purposes. And remember, if you’re unsure about a device and whether you should buy it or not, it never hurts to rent it and try it out before coming to that decision! Could Sony’s New Pico Projector Save Your Business Meeting In A Pinch? There are a few trends with technology that we all begin to notice. For example, when technology seemingly gets smaller and smaller. 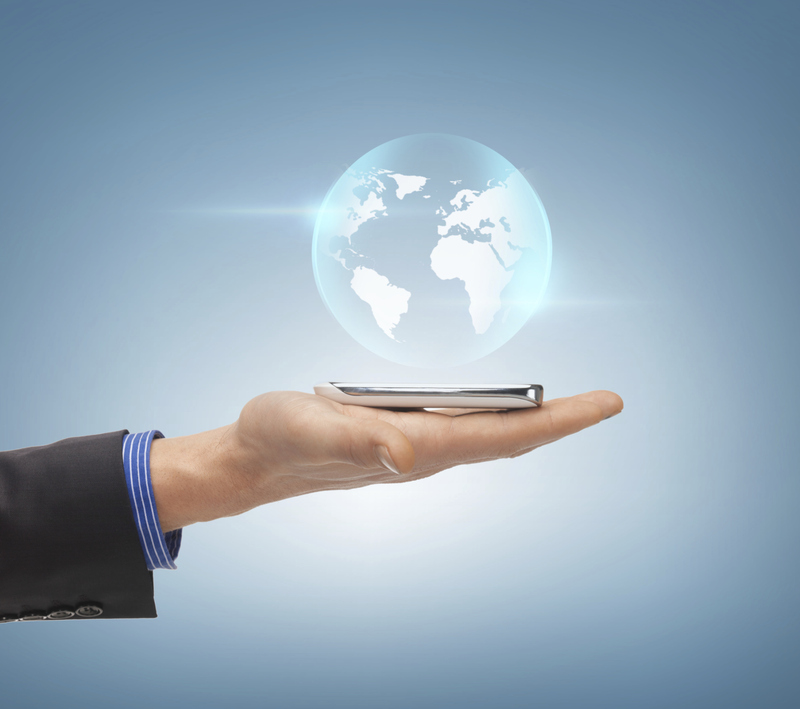 We see it with more mobile technology, but it has affected even larger hardware like desktops. We have seen the tablets and smartphones get smaller, skinnier, lighter, and sleeker. It comes with the advancements of technology. We will find ways to make our tech work more effectively while also making our tech smaller and less energy efficient. This has also affected the projector market believe it or not. The idea of pocket projectors is always something that can be seen as beneficial. The fact is, mobility with our tech means it becomes more accessible, and more accessibility means more areas for the product to function without being limited. Every time a new product is introduced, the limitations of that product are brought to light pretty quickly. Most of the pico projectors have had problems in the past regarding their resolution display. They have been limited to how well they are able to handle projecting in overly bright areas, and the overall sharpness of the picture. 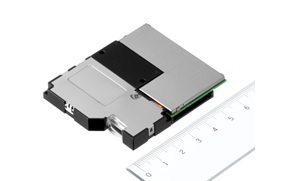 Sony has done their best to further the quality and production of the pico projector technology. Since we know how quickly technology advances, it looks as if Sony might be able to provide a pocket projector that is finally free from the issues of previous makes and models. How will this new projector make this possible though? Well, Sony conveniently has their own image processing system. The system uses something called LBS, or Laser Beam Scanning, to work their display module. By utilizing this particular display format, the new projector will be able to create HD image quality and a free-focus feature. The free-focus feature guarantees that the crisper image displayed, will retain its clarity even at distances up to 10 feet away. The free-focus will remain this way, despite the projection surface you are using at that time. With a 1920 x 720 pixel resolution, it may not be considered FULL HD, but it’s still much better than what has been offered on the market currently. Sony is also developing the product to work in tandem with your other mobile devices, such as your smartphone or tablet. They are also seeing how attachments, such as battery power sources and Wi-Fi hardware could help the usefulness of the product. It might not be the biggest, or add much to your mobile tech collection, but it could definitely help out in the office or at home. Having this freedom of mobility with something as essential as a projector is a huge step forward for displays. If you think about it, you are essentially carrying around a pocket HD TV around with you. Should your projector in the office decide to stop working in the middle of your presentation, you can pull this bad boy out and continue on. It could also be used to provide contrast information on whatever topic you may be covering in your meeting. Needless to say, having one of these in your tech arsenal would provide endless benefits. Turn Your Wall Into A 147 Inch TV Thanks To Sony! Bigger is better when it comes to viewing right? IMAX sure isn’t complaining about their revenue. Having a big screen TV is always nice, but projectors have always been able to fully utilize space. Projectors normally can be very aggravating with set up though. Mainly their placement has to be specific in regards to where you want your image to display. Not to mention all of the wiring complications. When setting up the projector, it normally has to be mounted on a wall or on the ceiling, then wired properly, and finally, the hole in the wall has to be fixed and repainted. Expenses just adding up. Now, however, there is a new projector that looks to do away with all of the extra hassle. 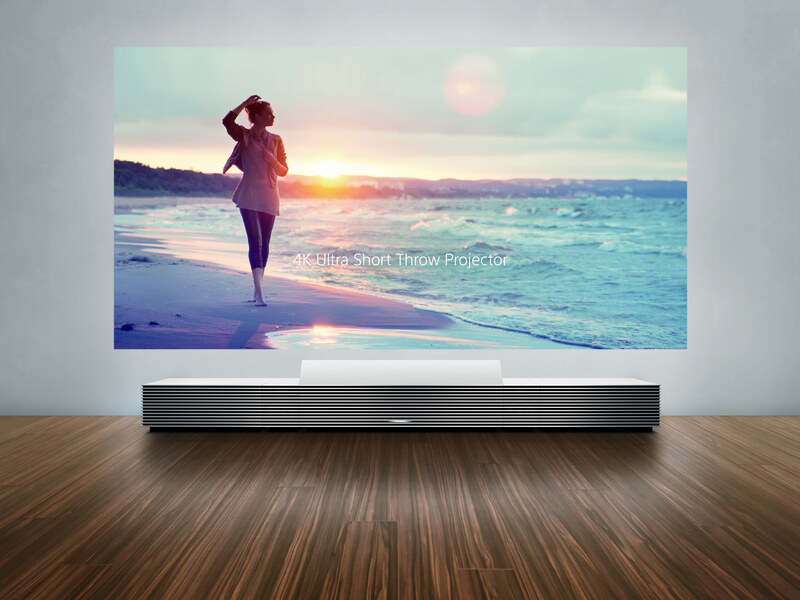 Sony has always been known for coming out with great products, and the Sony 4K Ultra Short Throw Projector is no exception. The largest TV out on the market currently is 108 inches. While that is quite the TV, remember that a projector can make your entire wall become a TV. This particular projector can actually make your wall into a 147 inch TV, as long as your wall is big enough diagonally. The 4K display of this projector really becomes noticeable at that size as well. There have already been a myriad of reports regarding 4K vs the HD we already have currently. At certain sizes and viewing distances, 4K isn’t even going to be noticeable to the normal human eye. This alone has caused many people to rethink any purchase they make when 4K is involved. However, when the image is being stretched to that particular size, the detail begins to really show. Think about it. The 4K stands for the range of roughly 4,000 pixels being shown on screen. If they have enough room to not be so compressed, the detail will remain in the image due to the high pixel count. The Sony 4K Ultra Short Throw Projector makes the 4K worth it. The projector itself already comes with a specific housing unit. With it being housed in a credenza, it can be pushed up against the wall and out of the way. When activated, the projector will actually display the image on the wall above it, instead of shooting the image across the room. This justifies the “short throw” name. This alone can do away with the annoying “shadows” cast when someone stands up directly in front of a projector feed. The Sony 4K Ultra Short Throw was introduced at this past CES event, and it came with quite the price tag. When it drops in the summer time, expect to shell out around $30,000 to $40,000 if you want to be one of its proud owners. For the office that may be looking for an upgrade, and with a wall big enough to show the improvement, this could be a worthy investment. Sitting in the back of the meeting can be rough for anyone with bad eyesight, so the added pixel quality could definitely help out. Just remember to measure for the right amount of wall space before you decide to pull the trigger on this purchase. Hitachi America has announced that it is now offering its CP-AW252WN ultra short-throw 3LCD projector, which combines a plethora of versatile features, including a new Projector Quick Connection iOS App and a Projector Cloning function in a compact, cost-effective design. This device, which is networkable and ultraportable, is capable of projecting a 100″ image from 15.4 inches away from the screen, making it perfect for use in educational and commercial applications where space is limited but bright, clear image quality is a necessity. The new Projector Quick Connection iOS App enables users to monitor and control multiple Hitachi projectors from a single Apple iOS device and also provides access to the projector’s Projector, Contents, Control and Settings menu. In addition to that, this device includes a new Projector Cloning function. The Projector Cloning Feature is a convenience feature that allows users to copy the settings data from one projector and transfer it to other projectors via USB memory. This function can also copy and transfer almost any projector settings, including gamma and keystone. The lens design of this projector enables it to be mounted close to a projection screen or whiteboard, preventing obstructed images and shadows and avoiding light shining in the presenter’s eyes. 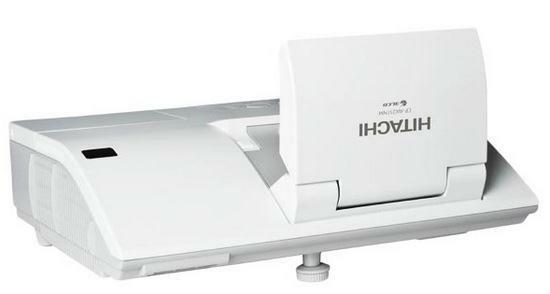 Moreover, the projector can also be used with an optional tabletop stand that enables images to be projected directly onto a tabletop, perfect for small group presentations or situations where space is limited. Wired and wireless network connectivity is also included via the projector’s RJ-45 Ethernet jack or optional USB wireless adapter. Once connected, content can be sent directly from a computer to the projector through the network while control monitoring and maintenance can be facilitated via LAN. This projector also offers a WXGA 1,280 x 800 resolution with 2,500 ANSI lumens white/color output and a 4,000:1 contrast ratio. It includes a wide selection of inputs and outputs, including HDMI, S-Video and Composite video inputs, USB and RGB computer connections, RCA, stereo mini-jack and microphone audio inputs, and audio and video monitor outputs. For business meetings or classrooms that are short on space, a short-throw projector is a necessity. Hitachi recognizes that and has put a lot of beneficial features into the CP-AW252WN that are perfectly suited for business and educational uses.